On the occasion of Pope Francis’ visit to the United States this month, when he urged American politicians to act on environmental change, on world inequality and on migration, Dantemag published an article of mine in which I analyse Francis’ encyclical Laudato Si. Click the link here to read the article: How the virtue of greed is destroying ‘our common home’ . Jeremy Corbyn, elected today as the new leader of the British Labour Party, may not have had much to say on environmental issues and, for all I know, my never have heard about a ‘basic income’. But he is passionately committed to eradicated unnecessary poverty in Britain and reducing inequality. He has been criticised by the Labour Party establishment and most of the media as a sort of throw-back to the past – someone who has never moved on from the 1980s. But actually he tapped into a new reality – which the other candidates completely failed to do – the increasing tendancy, among young people especially, not to join an organisation, but rather to ‘support’ a movement. So his campaign successfully mobilised thousands of people who stumped up just £3 as ‘supporters’ of the Labour Party. The ‘establishment’ may feel that this was a bit unfair, but they made up the electoral rules and Corbyn showed himself the more able politician in using them. No doubt the future will be full of in-fighting and compromises and disappointments. Nevertheless I joined the Labour Party today. In the weekend edition of the Financial Times, dated 5 September 2015, a front page article carried the title: ‘UK number crunchers conclude that money can make you happier after all’. The article was based on surveys carried out by the UK Office of National Statistics, and claimed that the result of the surveys disproved the widely supported thesis that higher levels of income do not bring more personal happiness. Specifically however, according to the ONS survey, it was net financial wealth (which might include cash under the mattress) that was associated with increased happiness, whereas: ‘physical assets such as antiques, yachts or cars […] had no relation to personal well-being’. So contrary to the claim of the article’s headline, this conclusion is hardly surprising. Net financial wealth offers people, whatever their level of income and wealth, some degree of security – which is certainly associated with greater ‘happiness’. Mr. Micawber said something very similar in David Copperfield: ‘Annual income twenty pounds, annual expenditure nineteen pounds nineteen and six, result happiness. Annual income twenty pounds, annual expenditure twenty pounds nought and six, result misery.’ The fact that physical assets make no difference to perceived happiness is indeed in line with, rather than in contradiction to, other studies that have been done on the matter. 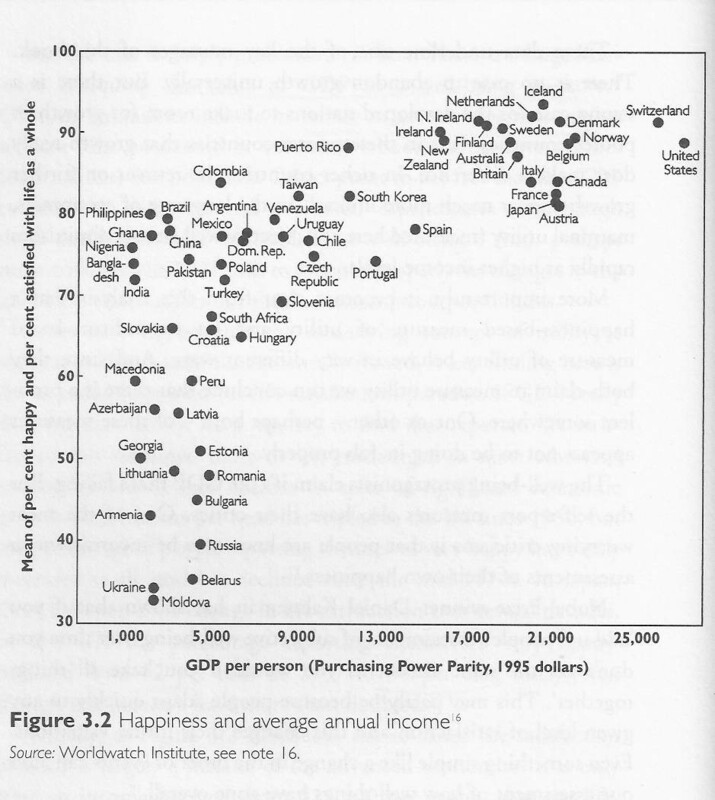 This diagram shows the result of one such international study on the correlation between the proportion of people ‘happy and satisfied with their life as a whole’ to per capita income of the country concerned. 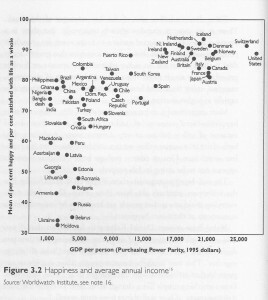 Broadly it shows that at relatively low levels of average income, where many people will be struggling to satisfy their basic needs reported happiness is low, but from middle income countries onwards this proportion tends to level off, making very little difference indeed among those countries with a high average income. While the conclusion may seem plausible the methodology of such studies is debatable. First, is the issue of how happiness is identified and indeed how easily the word and the concept can be translated into different languages and cultures. The second problem is that the income X-axis can extend to infinity, whereas the happiness, Y-axis, is constrained to lie between 0% and 100%. This of itself is bound to lead to some ‘levelling-off’ in the resultant graph.